On this page you will find a few printable blank game boards. 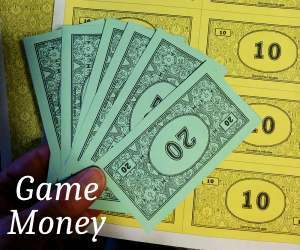 The boards can be printed on card stock or if you will be making "file-folder" games, print on heavy paper and glue inside of a file folder. After printing the game boards, be sure to look at Game Board Assembly if you need instructions on how to make the two printed board halves one whole game board. If you are having trouble printing the files, look at the Printing Suggestions. I have two game board types to print. One type is the Start to Finish game style in which the game has distinct starting and ending places. The other type is the Race Track game style in which the player goes around and around the board track until something happens to make the game end. Some of the templates are completely plain while others have some marking on them. Some are in color and some are not. I've included images to help you decide if you want to print any. The files are pdf and that means they are not editable. I know that is a disadvantage, but I made most of the templates from drawings, only one was made with a word processor. 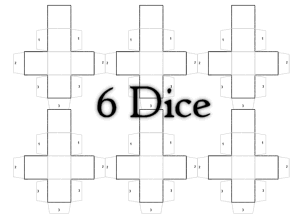 Yes, I have Printable Blank Dice and if you don't like what I have, go look at my Cube Templates. 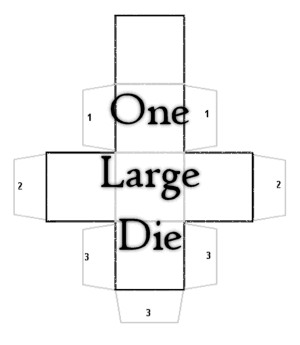 There you'll find printable cubes, or we can all them die on this page, in several sizes and, not only that, they are doc files so if you have die images that you want on your dice, then you can add it to the doc file before printing. When applicable, I included the images that I made for the game board. No files or images from this website may be used for commercial or for profit purposes. Both boards have similar markings. The file 006 has less detail. The game board below is similar to these two. The two game boards shown here are the Race Track type. The one on the left is a plain version of the 3 previous boards. The board on the right is very plain. Dice to cut out, write on, and glue together. If you think the margins are not wide enough on the files, use the Page Handling setting: Fit to printable area or Shrink to fit. or some similar setting. The option should appear when you press the pdf's print button. Printables to Play Store or to use for a yard sale.